As the globe shifts toward more technology consumption, the information and communications technology (ICT) industry strives to meet demand through sustainable sourcing of energy. 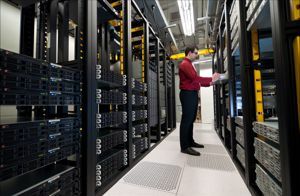 In the effort to cut down on fossil fuel usage, researchers have set their sights on making data centers more energy efficient, which could in turn reduce business overhead costs, according to Green Biz. Data centers themselves consume 1 to 3 percent of electricity in the United States while the devices connected to their infrastructure contribute much more energy consumption, according to a study on the growth of data center electricity use from 2005 to 2010 by Jonathan Koomey, a professor at Stanford University. Research shows data centers worldwide increased their electricity use by 56 percent between 2005 to 2010, with U.S. increasing by 36 percent. With their huge potential for energy consumption, data centers are the focus of more state and education institutions in the effort to become powered by renewable resources. As a shift toward sustainable sourcing related to data center management, professors at the Rocky Mountain Institute (RMI) and Clarkson University developed the idea of distributed green data centers (DGDCs) and performance-optimized data centers (PODs). "Imagine many small, geographically distributed performance-optimized data centers (PODs) that can operate either with the electricity grid as an interconnected resource or as an off-grid electrical island," RMI principal Kendra Tupper and Clarkson University assistant professor Stephen Bird wrote in Green Biz. As an alternative to diesel generated power used by many third world or underdeveloped countries with unstable power grids, PODs offer more flexibility and control. PODs are more energy efficient because its power source can come from different forms of renewable energy, like wind and solar. One POD can transfer its computing load to another for a more productive system. "The DGDC concept - as realized via PODs - can eliminate a significant amount of wasted energy, primarily by reducing transmission and distribution losses, but also through best practice cooling methods and other efficiency gains," Tupper and Bird said. By using more sustainable data center systems like PODs, companies can reduce their kilowatt-hours billed as part of business overhead costs.